The young boy who narrates Sing to the Moon has big dreams but when a rainy day keeps him from his exotic plans, he discovers a different kind of indoor adventure invented by his grandfather. The theme of the bond between child and grandparent has inspired many picture books. 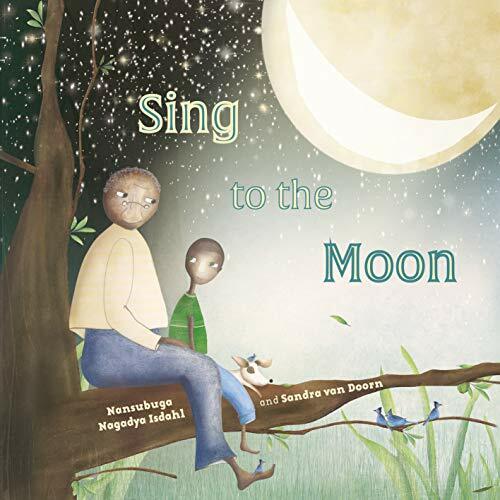 What's new in Sing to the Moon is that the boy and his grandfather, or Jjajja, are Ugandan. The grandfather tells stories about his own childhood as they both do chores inside, ending by cooking a tilapia stew. Then the night adventures begin as the two share more books and stories. The plot is familiar, as are the characters. The mood is cozy and loving. The ending, where the boy recognizes that being stuck inside with Grandpa was its own kind of wonderful adventure, is both predictable and sweet. The writing is in rhyme, not always successfully, creating a sing-song rhythm that echoes the patter of the rain keeping the boy from his wished-for dreams. The art fits the story well, reflecting its mood, but doesn't add anything beyond that. This is the kind of illustration that shows exactly what the words describe, no more or less. The best picture books are a creative merging where just reading the text or just looking at the art won't give you the whole story. In Sing to the Moon, that magic is missing. Nothing makes this story particularly stand out beyond the novelty of the Ugandan setting. Perhaps that's enough in these days of searching for windows and mirrors.